Stella Artois was first created for the holidays as a gift to the people of Leuven, Belgium. Each holiday season, the brand’s origins – reflected by the Latin “Stella,” or star – are celebrated in a variety of ways. This season, Stella Artois chose to lift up and celebrate real-world examples of thoughtful, timeless gift-giving. “Give Beautifully”, the commercial stars a piano, a film camera, holiday lights and more, all of which are now on the Stella Artois gift list. Even snow will be gifted. 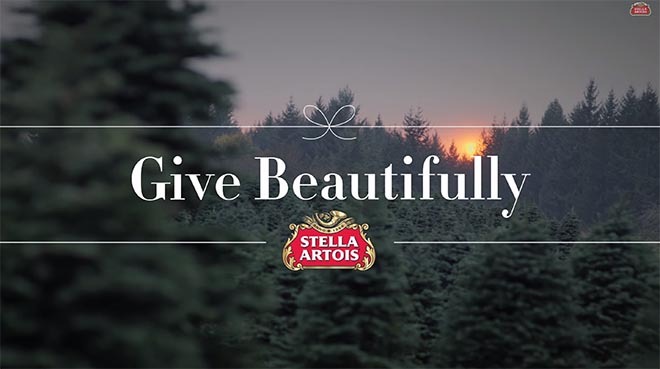 Stella Artois will tell the tales of the emotional moment the gifts meet their lucky recipients through a series of online short films, promoting the hashtag #givebeautifully. The “Give Beautifully” film series, shot in Argentina, the United Kingdom and the United States, will extend through the holiday season across 10 countries. The “Give Beautifully” films feature real people rather than actors. They showcase examples of loss and redemption, love and community, timeless romance and artistic beauty—as viewers follow special objects traveling to cities around the world to be revealed as gifts. Lights. Jeff is the owner of Parson Landing, a tree farm on the outskirts of Portland, a passion he took up when he and his wife Jaimee left their big-city jobs ten years ago. This holiday season, Jaimee will surprise Jeff by decorating an old oak tree on their farm with thousands of holiday lights. A romantic sight set against the Oregon sunset, it’s a dream Jeff has held for years. Jaimee will unveil the surprise during a holiday party with friends. Snow. It never snows in Buenos Aires. But one day in 2007, it did and that was the day of Florencia and Pablo’s first date. They’ve been inseparable ever since. For their wedding anniversary, Florencia wants to recreate the magic of the couple’s first date. See how she surprises her husband and the people of Buenos Aires with a rare, beautiful gift. Camera. Rachel moved to Nashville, TN, to follow her dream of being a documentary filmmaker. She makes beautiful films highlighting local artists and members of her community. As she strives to grow as a storyteller, she has been saving up for a camera that will improve her craft. This year, her best friend Emily wants to give Rachel a gift to help her realize her ambitions. Piano. Maeve moved from Dublin to London so she could be with her boyfriend, Brendan. She was forced to leave behind her beloved piano as it was way too big to move. A passionate pianist, Maeve hasn’t played since. This holiday season, see the beautiful surprise Brendan plans for her. The “Give Beautifully” spots are one element in a larger initiative intended to celebrate Stella Artois’ holiday heritage, including a limited-edition pack, gift packs and a 750ml holiday bottle, ideal for gifting and for seasonal celebrations. The “Give Beautifully” short films, full of memorable surprises, can be viewed at youtube.com/stellaartois. The Stella Artois Give Beautifully campaign was developed at Mother London by global executive creative director Gustavo Sousa, senior art director Mariano Cassisi, senior copywriter Sasha Markova, art director Hannah Tarpey, copywriter James Sellick, producers James Letham, James Turham, Craig Keppler and Bronwen Londsdale. Filming of “Fallen Star” was shot by 300ml via Park Pictures and Wanda Productions. Filming of “Snow” was shot by director Luke Monaghan via Riff Raff Films with director of photography Benjamin Kitchens, producer Matt Fone and production manager Jane Tredget. Editor was Paul O’Reilly. Post production was done at The Mill. Sound was produced at Wave Studios. Filming of “Piano” was shot by director Anthony Austin via Bosh with producer Jane Lloyd, production manager Dan Keefe. Editor was Jack Williams. Post was done at The Mill. Sound was produced at Wave Studios. Filming of “Lights” and “Camera” was shot by director Ethan Berger via After All with executive producers Ike Martin, Rian Moore, producer Francesco Soru, and director of photography Kevin Fletcher. Post production was done at Versus, New York, by editor Lindsay Houston, assistant editor Pilar Rico Sorianoo, post producer Samantha Louise, graphics/VFX artist Justin Barnes and colourist Matt Rosenblum. Audio Post was done at Digital One. Original music is by Alex Casnoff.